Why is a developmental milestone so often followed by a parenting fail? 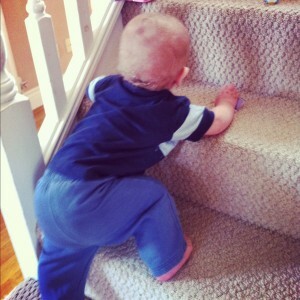 Yesterday Eli figured out how to climb stairs for the first time. He has been trying to figure out how to climb – mainly into the shower cubicle to access toys he’s thrown in there – for a little while but yesterday it clicked and off he went. It probably helped that one of Tilly’s toys was sitting there, tantalisingly out of reach, providing a great target for an almost one year old to try to reach. Of course, no good developmental leap is finished without a bit of parenting fail attached. I didn’t move the toy. I just left it there, sat on the stairs, and then we fast forward to today. Today Eli had the most epically awful pooey nappy – it was one of the reasons why cloth nappies are both perfect and horrible. It was in his night nappy and thankfully contained by the wrap so not many of his day nappies would have coped and a disposable, no chance. I mention this not in the way that parents feel they need to talk about the contents of their baby’s nappies but to explain why I might have been a little distracted. Eli was playing with Tilly in the lounge (or so I thought), I was finishing sorting out the dirty nappy and then I heard the – in hindsight inevitable – bump, BUMP, WAAAH! I gathered up Eli from the foot of the stairs, cursed my shoddy parenting, despatched Tilly to her bedroom with the offending toy and was thankful that said toy was only a few steps up. The boy had given himself a fright but had no injuries. We now have a policy that nothing is to be left on the stairs and I’ve had a reminder that new skills will be practised, preferably supervised and regardless of pootastrophies. This entry was posted in Kids and tagged development, eli, milestone, nappies, night nappies, parenting fail by twigletmac. Bookmark the permalink.